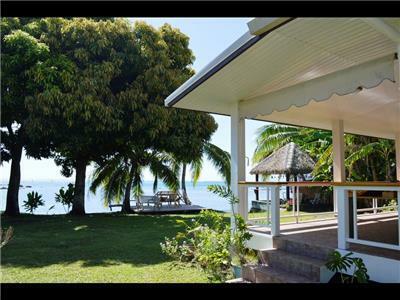 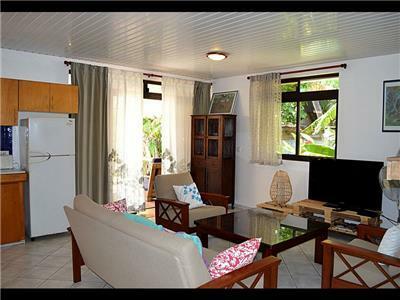 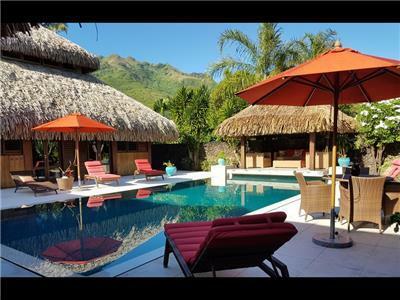 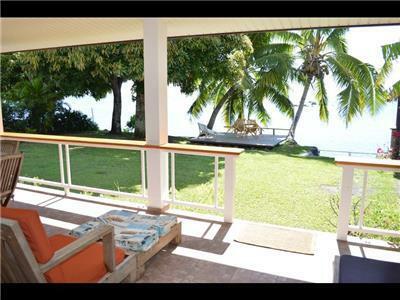 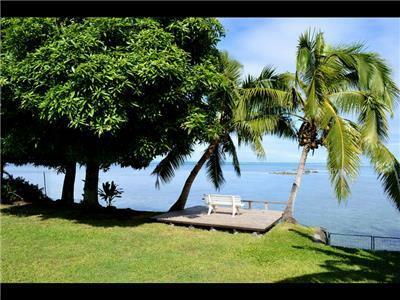 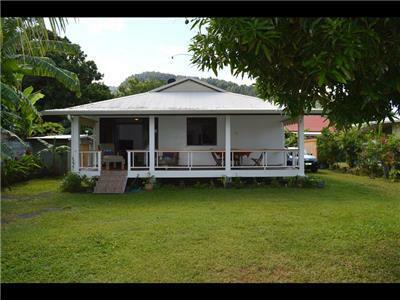 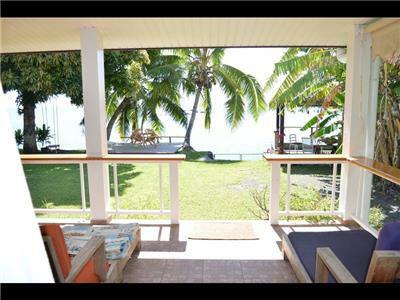 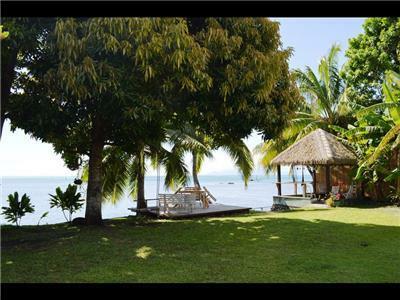 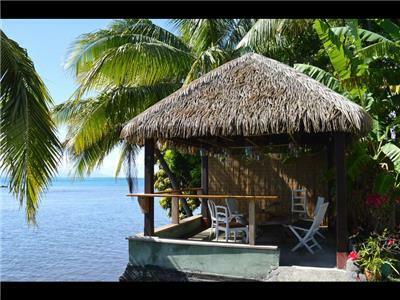 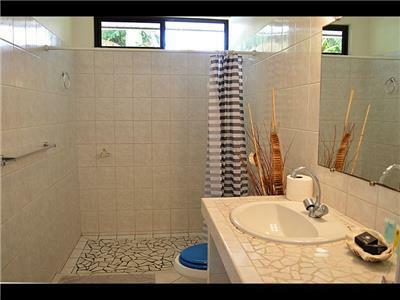 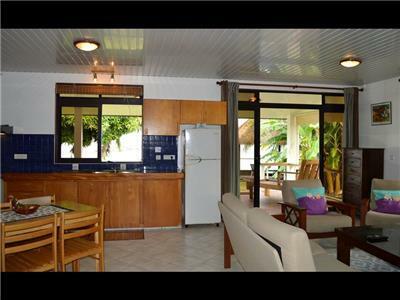 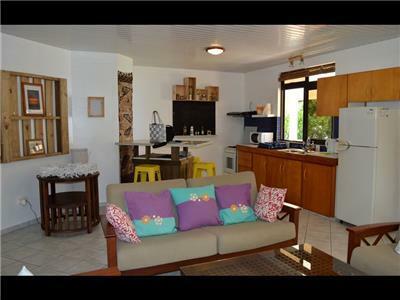 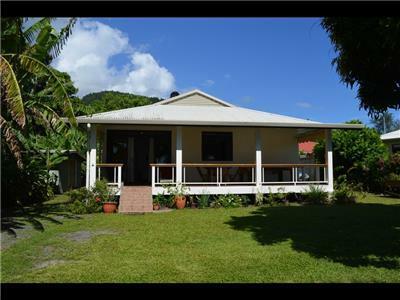 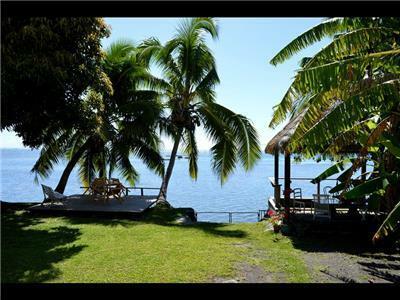 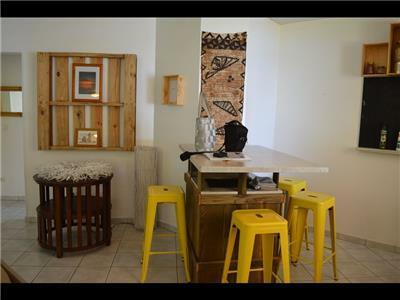 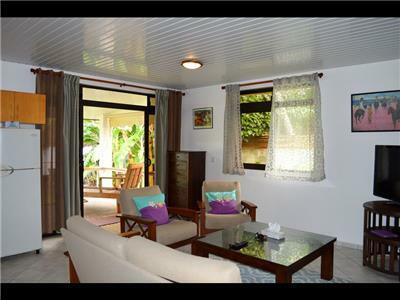 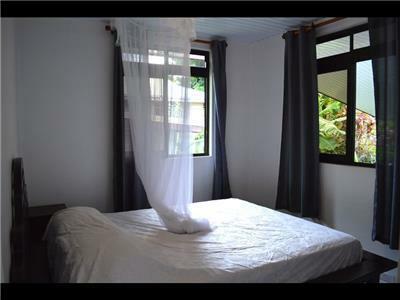 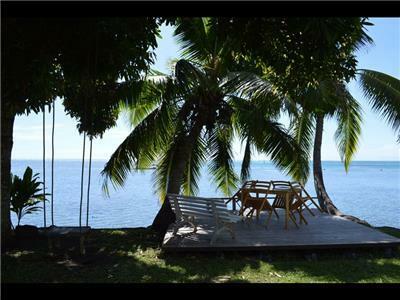 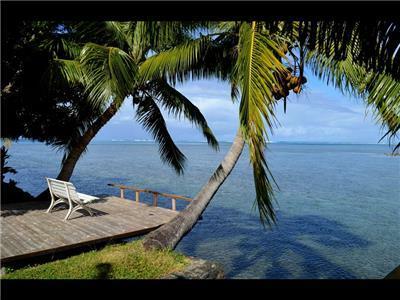 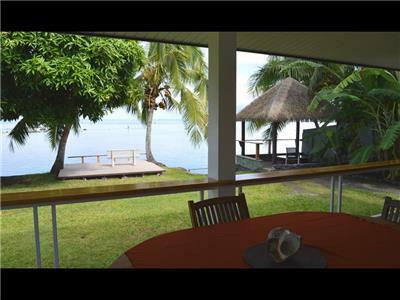 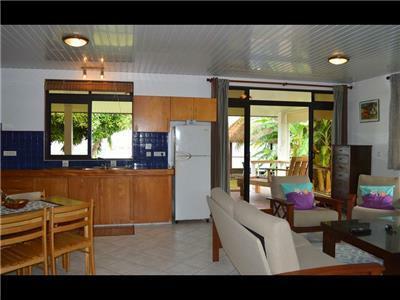 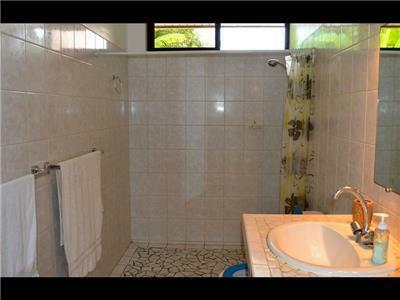 Faré Mokalei is a 2-bedroom house for rent located on the lagoon side of Paea city on the south west coast of Tahiti island. 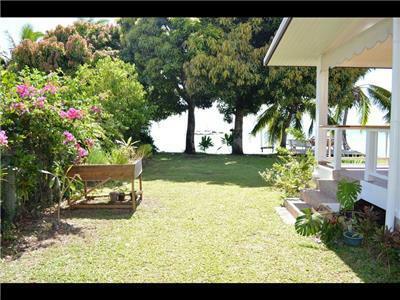 This little holiday house is surrounded by a garden planted with coconut, banana and mangoe trees and flowers. 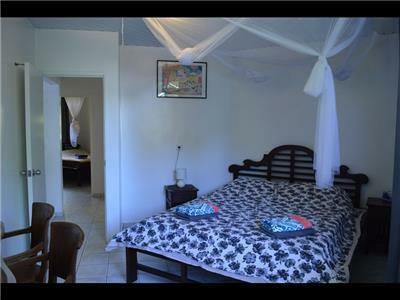 Faré Mokalei has two bedrooms both with air conditioned, mosquitoe nets and ceiling fans. 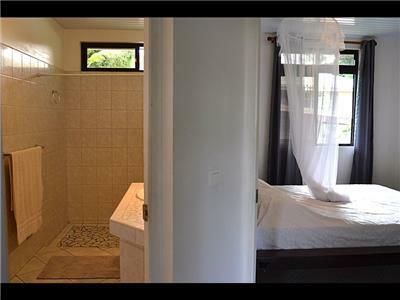 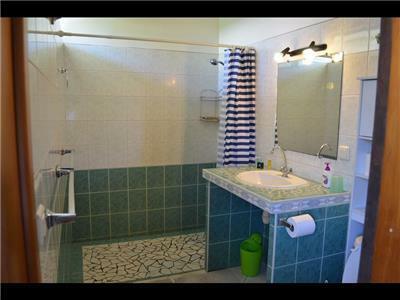 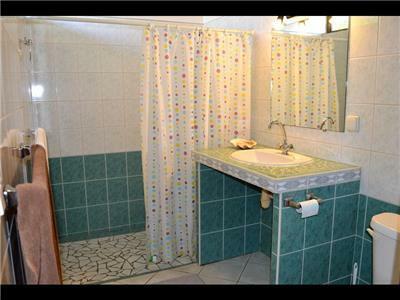 There are two bathrooms with sink, shower and wc. 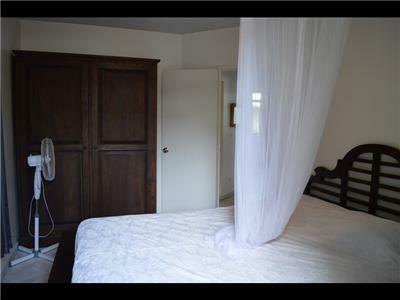 An aditionnal bedroom with fan only. 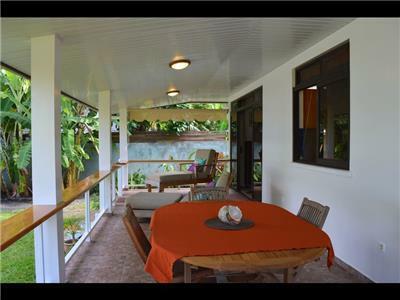 The living and dining room opens onto a large covered terrace ideal for dining anytime of the day and whatever the weather. 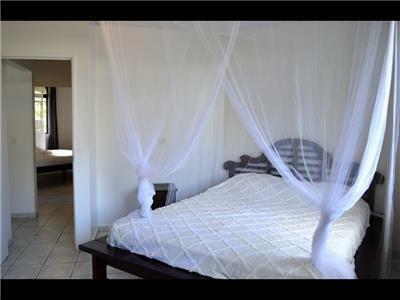 Recently entirely renovated, the house is very clean and offers all comfort necessary for travelers on holidays. 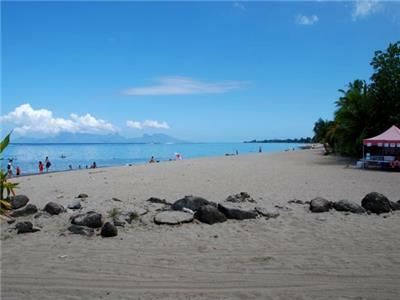 This is a great place for vacation especially if you like to surf and enjoy swimming. 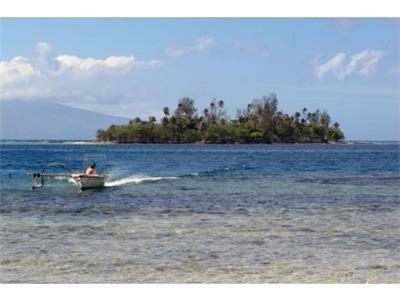 Faré Mokalei is located nearby the famous surf spot Mara'a, a right surf break! 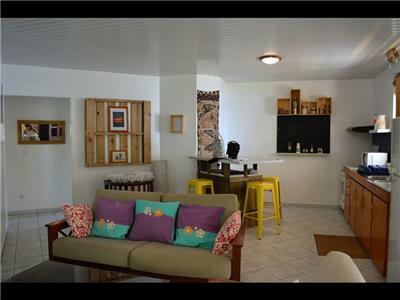 Next to the house in a storage room, guests will have access to paddle board and snorkel gears. 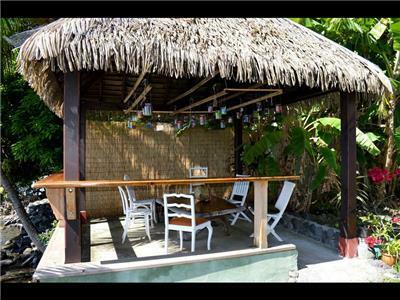 The deck on the lagoon side is an inviation to admire spectacular sunsets and the lagoon colors. 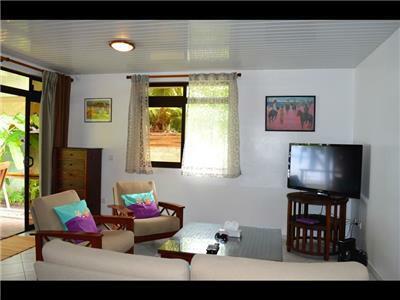 The property is secured and gated in a very quiet neighborhood. 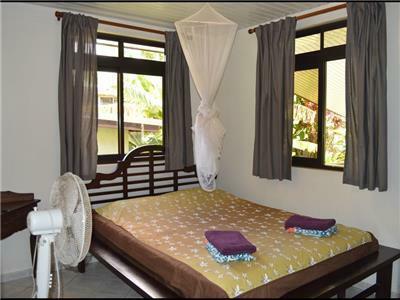 Please be informed that an electricity fee will be required for all stays from 14 consecutive nights. 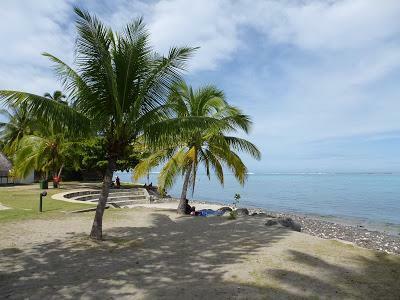 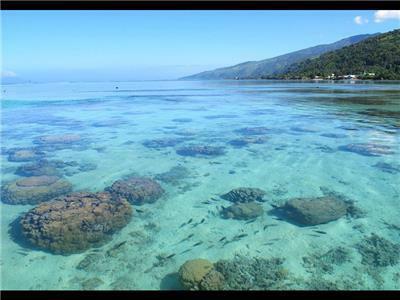 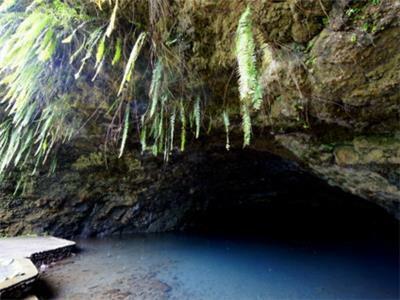 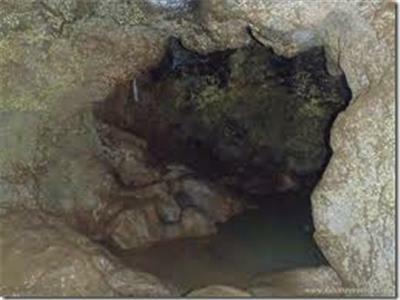 Grotte de Mara'a	 Tourist Attraction 3129 ft.
Mahana Park, Tahiti public beach	 Beach 5.28 mi. 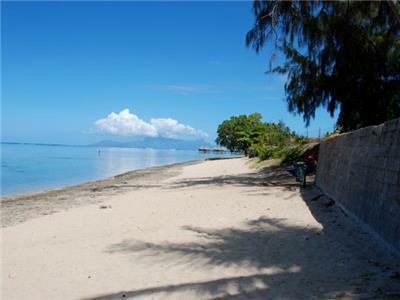 Public white sand beach also named as "PK 18"	 Beach 5.62 mi. 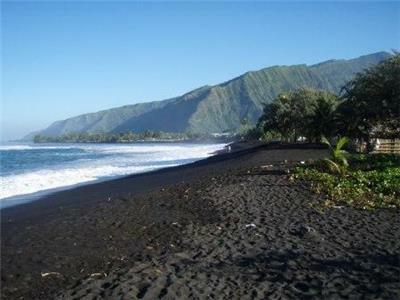 Papara black sand beach	 Beach 6.85 mi. 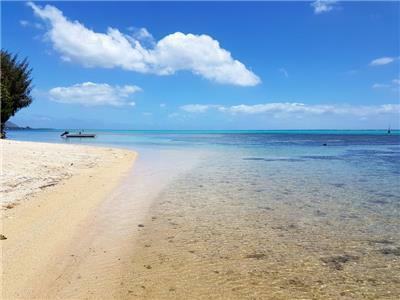 TOAROTO PK 15,5 - Public white sand beach	 All Seasons Attraction 7.08 mi. 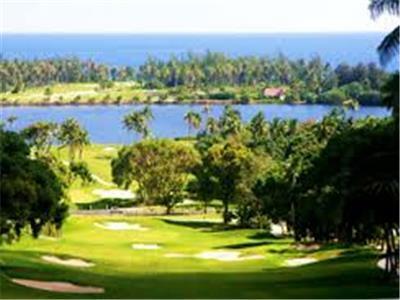 Olivier Breaud International Golf Course	 Golf Course 8.35 mi. 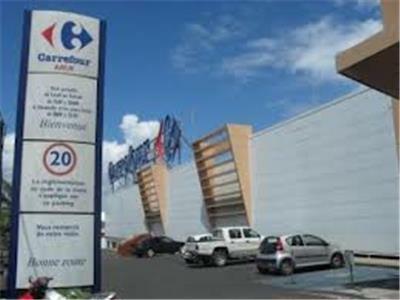 Carrefour Arue	 Shopping 14.78 mi. 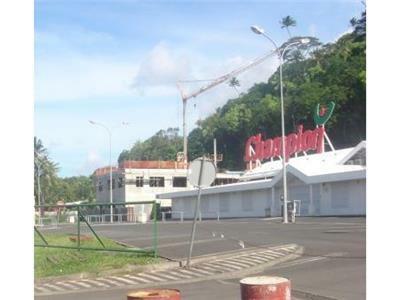 Supermarket "Champion"	 Grocery Store 16.97 mi. 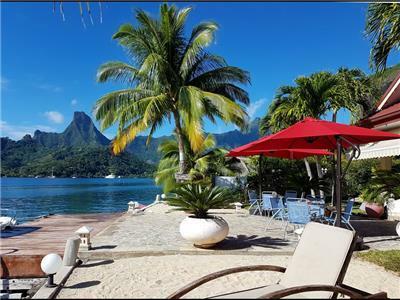 Lagoonarium Village - Moorea	 Tourist Attraction 19.20 mi. 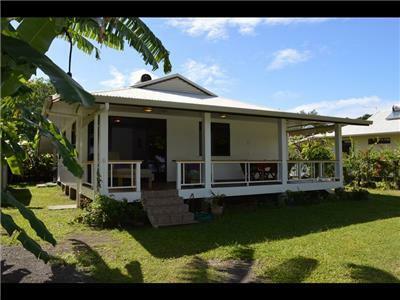 Lavatube Tahiti - Hitiaa	 Summer Attraction 19.86 mi. 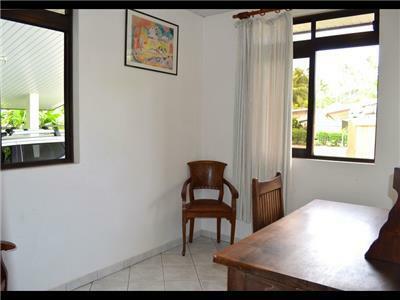 Nous tions 2 couples d'amis avec un enfant de 2 ans et sommes restes au Fare Makalei pendant 2 semaines. 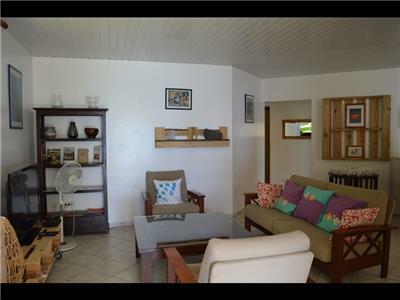 Cette maison est superbe sur tous les points, trs bien entretenue et confortable et le jardin donnant sur le Lagon sur lequel les couches de soleil sont tous les soirs plus extraordinaires les uns que les autres font du Fare Moakalei une perle rare... Ctait dur de quitter les lieux et c'est donc avec grand plaisir que nous reviendrons... Nhsitez pas a en faire votre lieux de vacances, vous ne serez pas dus! 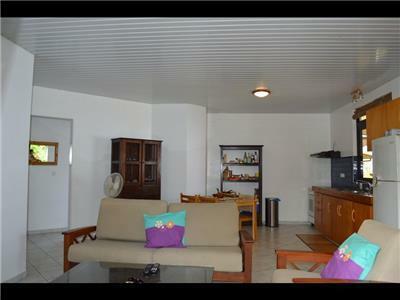 Merci galement a Laina de l'agence Tahiti Homes pour sa logistique sans faille et son accueil chaleureux a l'image de la Polynsie... Cedric. 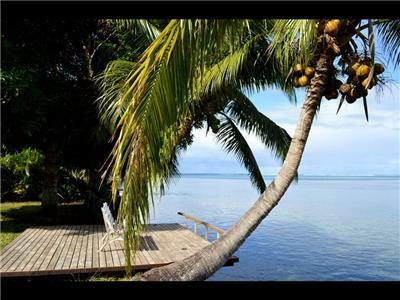 The sunsets are some of the best we've ever seen - wow, each one so different but so perfect and gentle. 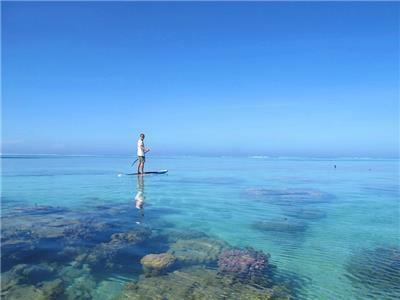 Great way to see the real Tahiti!